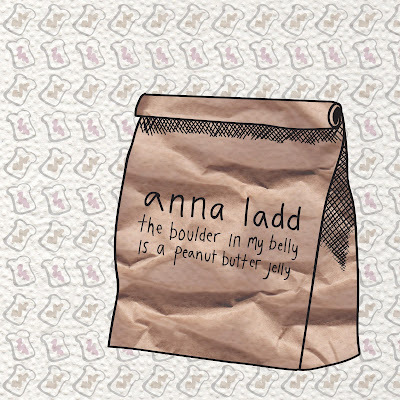 anna ladd confronts post-grad troubles on her new album. anna ladd is a photographer and songwriter who communicates her feelings about sociopolitical topics through her art. She recently graduated from art school in Pennsylvania, and is struggling to adjust to the “real world” and the challenges that come with the expectations of adulthood. ladd has worked as an intern and assistant in the art world, been a member of many creative groups, and still finds time to create striking and expressive music that will resonate with anyone feeling the post-grad uncertainty. ladd’s new album, the boulder in my belly is a peanut butter jelly, vocalizes many of the belittling judgments that make marginalized groups roll their eyes, lock their jaws, and clench their fists on a daily basis. She approaches these topics with a frustrated passion and occasional humor, expressing how these situations effect her view of herself and the world around her. ladd comes up against these aggravating unwanted opinions, from being labeled as androgynous to being mansplained about pedals and guitars. The instrumentals on the album are folky and fuzzy, but the hum of the guitar can get as loud and angry as ladd's voice. Tracks like “vegetation” use dissonant string picking to mirror the tension and discontent in her words. ladd switches off between singing and spoken word, using sarcasm and brutal imagery to air out her anger. “capitalism,” the final track, wraps up all the album’s grievances into a single song that criticizes society’s skewed values and how these ideas have spilled over into ladd's life, provoking her to find validation through social media and band recognition. The pressures of society are wrapped up in ladd’s swirling vocals, calling out her insecurities and self-doubt. ladd succeeded in crafting an album that acts as a millennial voice of reason, no matter your graduate status. "I’ve never been well acquainted with anger or bitterness, but the overnight transition from School to Real Life put me face to face with parts of myself that I didn't recognize. The biggest pieces of my identity were put on hold for Being An Adult, and the post-grad-life that I had pictured for myself seemed so distant from what I was actually doing. How do you maintain your Instagram persona when you're struggling? Can I skip the whole “career” thing, sell out while I’m still young and hawk detox teas on YouTube? This is a record about confronting and embracing bitterness - because it’s there, even in my generally positive-and-relentlessly-motivated brain, concentrated directly between 'where I am' and 'where I want to be.' I’m learning how to be comfortable sharing it in a way that doesn't sound like an apology." Listen to anna ladd on bandcamp.